“Nordic Woman” is an 18-track compilation album featuring - unsurprisingly enough - Scandinavian women musicians and bands in a celebration of all things Nordic and female. There are many fine singers obviously, the Northern lands having rich and ancient female vocal traditions, although I must admit the only one I’d heard of previously was the Sami singer Mari Boine, but there are also some great contributions from Icelandic singer Bára Grímsdóttir and Norway’s Unni Løvlid. However, there has recently been more emphasis on women instrumentalists and this is represented by Norway’s Annbjørg Lien on the Hardanger fiddle and her fellow Norwegian Tuva Livysdatter Syvertsen on fiddle (of the Valkyrien All Stars) although she sings too. There are also mixed gender bands included here such as Sweden’s Frifot, Garmarna and Ranarim, Denmark’s Valravn and Phønix, and Finland’s Suo. The music on this compilation ranges from the traditional music of Frifot, the stripped-to-essentials acapella of Kirsten Bråten Berg, the delicate sounds of Suo’s kantele and vocals, through to the darker rock offerings of Valravn and the uncompromising songs of the Finnish vocal quartet Suden Aika. There are also the more experimental trance-llke sounds of the Sami duo Adjágas and the powerful harmonies and other-worldly vocal elisions of the acapella group MeNaiset. Iceland’s Ragga Gröndal and the Icelandic Folk Ensemble offer up a strange, slightly off-kilter song which pits a child-like voice against a military snare march and polyphonous layered vocal and instrumental notes, like weird musical drops in a pond that ripple out, hit the surrounding sonic ripples and return disturbed. Fellow Icelander Hei∂a Árnadóttir also delivers her vocals over a deliberately off-centre rhythmic matrix to interesting effect. Denmark’s Phønix give an assured performance which makes good use of Anja Praest’s bass clarinet against Karen Mose’s voice. Sweden’s Garmarna take Abbess Hildegard Von Bingen’s “Euchari” and give it a 21st Century digital blood infusion with interesting results that still allows the beauty of the original praise song to shine through. Compatriots Ranarim deliver a very danceable and upbeat number to get us all up and bouncing around, before the album finishes with the serene and pure sounds of Norway’s Tone Hulbaekmo. I wasn’t sure what to expect, but this album is well worth a listen. My only criticisms are that Deeyah’s liner notes to the album (and especially the foreword and associated text) come across as a little ‘dry’ and the tiny font size caused me many problems trying to read (especially the burnt orange notes against the chocolate brown background of the booklet - not very user-friendly at all), however the music itself is good, often very good indeed, and stands on its own merits. 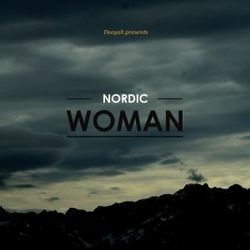 “Nordic Woman” is a useful and enjoyable overview, not just to the female exponents of Nordic musical traditions, but to Nordic musics in general in all their different cultural flavours and fusions, from Iceland to Finland and from the Danes in the South to the Sami in the North. Glad I took the time to listen.